Free Shipping Included! 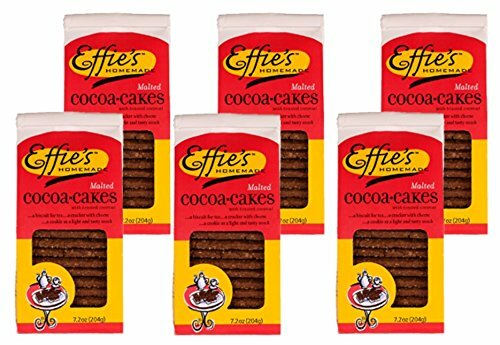 Effie's Cocoacakes, All-Natural Homemade Lightly Sweetened Gourmet Biscuits, For Real Food Lovers Craving Homemade Taste (6 Pack) by Effie's Homemade at Smokey Robinson Foods. MPN: 1. Hurry! Limited time offer. Offer valid only while supplies last. Our signature Oatcakes now have a chocolate-y twist. Effie's Cocoacakes are crisp, buttery cookies lightly malted and layered with toasted coconut. Our signature Oatcakes now have a chocolate-y twist. Effie's Cocoacakes are crisp, buttery cookies lightly malted and layered with toasted coconut. Deep, dark and oh...so delicious, try with a glass of cold milk or crumble on top of your favorite ice cream. If you have any questions about this product by Effie's Homemade, contact us by completing and submitting the form below. If you are looking for a specif part number, please include it with your message.